NOTE: This will take you about 15 minutes to read and look at. I spent Monday working with a local publishing house carrying out a mix of consultation-via-workshop, in which by teaching my frameworks and case studies, we workshop the content and create a strategy for the company. It’s very much the same as what we did with the Finland Tourist Board at the Like Minds Summit last month. True to form, the day is full of my hype oneliners. One of the main ones that I drill is “don’t target everyone, target the right ones”, which of course is about correctly understanding your community, and who the influencers within that community are. What really irritates me is when I ask this question and then have to start from scratch trying to understand my community. That’s why I create models and frameworks: for my own use and my own sanity! However yesterday I realised that I haven’t really shared how useful this model below (The 7 Levels of Participation) has been for me with understanding communities. For me, Social Media is about social, which is about relationship, which is about participation. Relationship is participation with one another. The deeper the relationship, the more participation we have with each other. Therefore I like to understand a community based on their varying levels of participation. If a community has higher levels, my strategy will fundamentally be different than if my community had low levels of participation. Obvious I know, but I have to get data in the door. I can’t just go on instinct or on the tidbits of feedback I have. It’s funny sometimes how one bit of customer feedback can change an entire decision, normally because we swell every bit of quantitive feedback we have in significance, because it’s often the only bit of feedback we get! I make sure I have qualitative and quantitative data on my community, and many times you can use tools like TweetReports, Facebook Insights and PostRank (affiliate link) to get a good deal of your quantitative data and also seed feedback requests for your qualitative data. Just the act of getting your numbers helps you get better perspective. 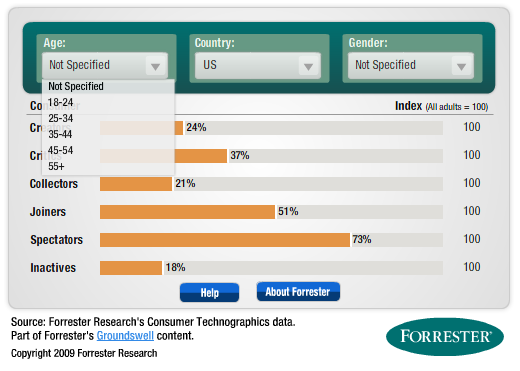 I use Forrester’s Groundswell Profile Tool which I enter the ages, genders and locations of my community into to get their generic profile types back. These types are linked to the 8 types on Forrester’s Groundswell Ladder. The groups that this tool returns (Contributors, Collectors, Spectators, etc) don’t map exactly to my model, which is fine. The point is, it gives me a very good general direction. This also raises the question of why you’d even use my model instead of Forrester’s. My reason is that the Levels of Participation is built specifically with participation actions in mind. So, as per my model, Comment, Consume, Compete, Create, etc are all actions that have pretty obvious tools connected to them. Now that I have profiles from Forrester linked to my stats, I begin to see where certain demographics will lie on my Participation Model. So, I know that my 18 – 24s, for instance, are more likely to be ‘Critics’ than my 55+ age group. However, the generalisms of this data aren’t always correct and don’t take my influencers into account either. 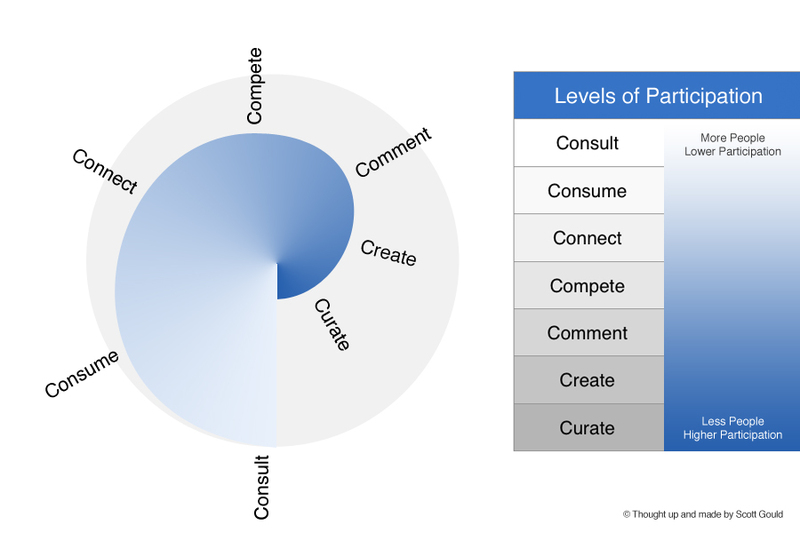 My next job is to analysis my stats, using the profiles from Forrester as a helping guide, and then link them to actions from the Participation Model. Here is where it becomes, hopefully, clearer as to why I have created this model. What I need to do is have a sliding scale of Social Media actions – going from the least participatory to the most participatory – with clear strategies and tactics linked to each of those levels. And that’s what my model does for me. Now that I know what the community is doing and how they participate, I can help them do more of it, seek to fill the gaps, better enable them, etc. The big benefit is that if the community does a lot of consumption, but not much creation, then I know I shouldn’t spend all my resources on trying to get them from a level 2 to level 6. But I see people make this mistake all the time – the overestimation of participation – where they expect hundreds of people to just ‘send in photos’ or ‘write comments’ without knowing if and how these guys participate. So if the majority of my community are consuming, then I might want to find ways to get others to consume through their consumption (share buttons, for instance.) If I want to up their level of participation, I need to find a way to convert their consumption into a connection. If I can get them to like my Facebook page, then all their friends will see they’ve liked it, so that’s a useful connection to make. This is more meaningful than just trying to ‘get them to comment and share their photos’, which whilst young people are more readily prepared to do, most won’t for a brand (they’ll just do it for themselves), and most over 34s aren’t to keen on it either. Here is where the hard work begins because we then have to implement our strategies and ideas. I also have further things to share on where I take it from here, but until then, I’m keen to get your feedback and hear your leading thoughts. I don’t expect you’ve used this model – but what models have / do you use for profiling? Is participation the main thing that you want to measure? It is for me, but am I being idealistic here? Can you go away and use this approach tomorrow? If not, why? This a is a great, really practical post and discussion starter. I love that you’ve shared the tools you’re using. Knowledge (subject matter) is the more important currency – shared interests and passions. That said, the framework you’ve articulated will flush that out (returns, engagement etc) in a structured manner. This looks interesting and might qualify as ‘cut out and keep’. I’ve scheduled some time to look at it properly and think about it. Thanks Claire for the kind words. I found the similar feelings with age and gender too, and I found that Forrester’s types are just too ethereal. I really need to know specific actions. I spent a lot of time researching this, and find that wherever I consult or talk, the sliding scale here is correct. Great – enjoying the work I’m doing at the moment and loving the people I’m working with/subject matter. Thanks for asking. I freely admit I get the general gist of this article but don’t really understand it.But sometimes you read an article which you don’t understand and instinctively (wrong word) know the way forward is to get to understand it. There seems to be a parallel in intent between the 12boxes model, which is about relating to individuals and sometimes groups of people at the level they understand and developing a strategy to move them to where you want them to be – such as appreciating the value of a potential solution. Here, if I understand you correctly, you are looking at how people are participating (or likely to participate) and deciding how to serve them where they are, and look at how you might realistically escalate their participation towards relationship one step at a time. Is that right? Admittedly, you’ve come into a blog where there’s been lots of discussion and so most of the readers here ‘get this’. I will make sure I break this down a bit over the coming weeks for you. The general ides, you’ve got right – looking at scaling levels of participation in order to best serve people! I used the old version of this post as a reference (I’ll be updating the bookmark), because the whole world is trying to explain this “engagement” thing. You start throwing around “engagement” and “participation” with old world, or local business owners who are worried about next quarters revenue & you start getting blank stares. Having something that shows them, in depth what engagement means for their brand & for their cause and then it clicks. You sir, are the master of pretty pictures. Thanks Sy for the kind words. Theres far more to it than this. The Immersive sessions that we do tie all my frameworks together and show how they flow – it’s quite amazing stuff actually! Glad you find this is helping you! Sy, this framework does come right in the middle of a whole presentation that I do with Like Minds Immersive, so no wonder it’s hard to understand. I’ll be sure to explain it a bit more in the coming weeks and contextualise – and you need to make sure you get to a Like Minds Immersive! Measurement is available mostly with free tools here. The analysis is where time and expense increase. For levels 1 and 2, you really only need Google Analytics and Feedburner stats. It is around levels 4, 5 and 6 that a lot more time is required to collate data – especially if you’ve got a large community. 1000heads are exceptional at how they measure this stuff – I’d like to interview them, because how they measure, I think, would be the best for this model and many organisations like yours. For startup communities, I think measurement would take them 2 hours a week – a well worth it task, considering that what gets measured gets managed. Let me see what I can do. They’d only measure if you were their client, so perhaps what is better is if I can glean what they do and then share that? ok, makes sense, thanks for the help. As usual, which is a good thing, your article causes me to pause, reflect and think. Sometimes I can’t respond immediately at the end of my first or second reading as I need to “chew the cud,” percolate and meditate on what you are saying. That’s a good thing. You challenge me. So how do you profile that level of participation if I don’t respond? You can’t. You have no idea of the impact you have on me. 1) Wow, that is a lot of responsibility on you to maintain, nurture and grow your community. That burden must be huge. Profiling alone could take a good chunk of time, much less designing strategies to get others to participate at some new level. At what point do you begin to empower your community members to help nurture and cultivate with you? When and how do you empower your community members to help each guide, lead, share and work with each other? And does that happen on your space or are they doing that somewhere else? And what are you doing to help harvest the community, reinforce and recognize valuable community contributions to drive engagement? Seems like you would want to have others help share the load, stand in the gap, be “king & queen makers,” and help grow the community? First of all, many thanks for the comment, and the kind remarks. As you know, I greatly value your insights and your writings, so thank you! I don’t measure *this* community to this extent. For other communities, then yes, it can be done. Many tools like PostRank are making this a lot easier and more automated. The initial measurement – which clients want – is very useful and provides a benchmark. Your slew of questions – that require practical answers – they would go in a community management model, right? I know where they go, I know how it develops – but I haven’t got it written down. This model maps over another framework, about ‘scattering’, ‘gathering’ and ‘mattering’, in which I can tie off some of these answers to your questions. WIll check out the video and get back to you on what I learn! I should have said those were rhetorical questions just to spark conversations and not ones you had to imediately answer! Also, I was wondering if you meant measuring participation from a community perspective on your own site or for your clients. Jeff – sure – they are very good conversation starters! Will think these things through. They are harder to quantify for sure! I’ve got a stack of your blogging to catch up on – will get to it soon! 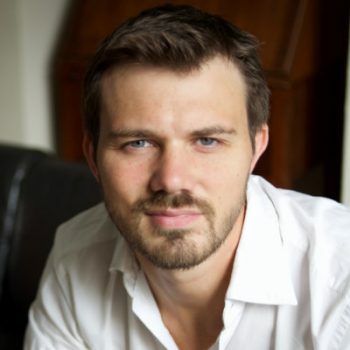 Hi Scott – The 7 levels looks like a really great way to get a handle on a community. Reminds me of the process a person goes through in the buying cycle. Thanks for sharing and for the link! Thanks Kristof. There’s more here that I’ll be unpacking over the coming weeks. Tweetreports is a major tool here!